The relation between spirituality and subjective well-being was measured in 176 (56= male, 120= female) college teachers trom four Catholic college teachers of Bangalore. Teachers rated their own spirituality using the Spiritual Competence Scale (Sing & Premrajan, 2007). Teachers' subjective well-being was measured using self-report based on the Satisfaction with Life Scale (Diener, 1985) and Positive Affect and Negative Affective Scale (Watson, Clark, & Tellegen, 1988). Scales scores were computed by using spss-20 version. Correlation and simple linear regression were carried out. Results revealed that there is a significant positive relationship between spirituality and subjective well-being and also subjective well-being can be explained by spirituality. Spirituality, Religion, Happiness, Subjective Well-Being. Anthony, N., Paul, J., & Fenzel, L. M. (2000). Personal spirituality as a moderator of the relationship between stressors and subjective well-being. .Journal ofP^ychology and Theology, 28(3),22-228. Diener, E.D. (1984). Subjective well-being. Psychological Bulletin, 95(3), 542-575. American Psychological Association Inc.
Diener, E., & Larsen, R. A. (1985). Satisfaction with Life Scale reference. .Journal of Personality Assessment, 49, 71-75. Guillory, W. A. (2000). The living organization: Spirituality in the workplace, innovations internationalinc. Salt Lake City: UT. Luthans, F. (2002). Positive organizational behavior: Developing and managing psychological strengths. The Academy of Management Executives, 16, 57-75. Mathew, T. C. (2003). A study of organizational commitment of degree college teachers in relation to work values, self-actualization and leader behavior of principals. Indian Educational Abstracts, 4(1), 86-87. Moxley,R. S. (1999). Leadership and spirit (sXqA). The Jossey-Bass and Management Series and The Centre for Creative Leadership. Neck, C. P., & Milliman, J. F. (1994). Thought self-leadership: Finding spiritual fulfillment in organizational life. Journal of Managerial Psychology, 9(6), 9-16. Pamami, M., & Mittal Uma, H. A. (2013). m5.pdf. 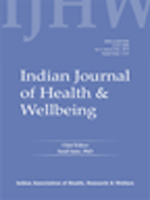 Indian Journal of Health and Wellbeing, 4(A), 903-908. Singh, B., Gupta, P. K., & Venugopal, S. (2008). Organisational commitment: 'RswisitQd. Journal of the Indian Academy of Applied Psychology, 34(), 57-68. Singh, T., & Premarajan, R. K. (2007). Individual spiritual orientation at work: A conceptualization andmeasure. Banglore: IIMBanglore Research Paper. Watson, D., Clark, L.A., & Tellegen,A. (1988). Development and validation of brief measures of positive andnegative affect: ThePANAS scales. Journal of Personality, 54,1063-1070. Wills, E. (2009). Spirituality and subjective well-being: Evidence for a new domain in the personal well-being index. Journal of Happiness Studies, 10(1), 49-69.